This is done in the same hope as the other topics here; to help us keep track of a resource. In this case it is the buildings that are in Ther'avare; who is using, where they and maybe a few fun notes on them. If there is a building that you want, leaders, please let me know and I'll try to update this as soon as I can. But remember that this is between players, while the GMs do pay attention to the forums, if you want the building to be official in the comic, let them know. Well, there you go; make your comments and I hope this helps. Last edited by Merlune on Mon Dec 14, 2009 12:52 pm, edited 13 times in total. The Engineer's DO need a place to set up permanent shop. Just so you know, #2 is marked as the "Slave Interrogation Room," and is being used by the Overseers. We'll give it back when a proper slave quarters is built. couldn't the collection of small building be the living quarters of the clan members? PenDragon wrote: Just so you know, #2 is marked as the "Slave Interrogation Room," and is being used by the Overseers. We'll give it back when a proper slave quarters is built. I wasn't really planning to give it back it's cold and damp and has hooks on the walls and I haven't really prepared another torture/interrogation room in the new slavequarters. Miburo wrote: I wasn't really planning to give it back it's cold and damp and has hooks on the walls and I haven't really prepared another torture/interrogation room in the new slavequarters. Well, in that case... #2 is Overseer property; look but don't touch! The slaves aren't actually housed in there since the conditions are abominable. and they kinda made me promise not to use it on them. 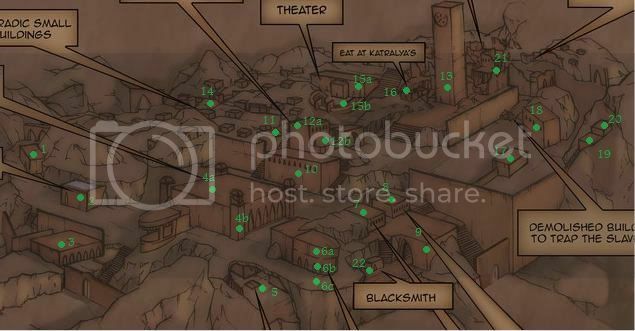 Also #9 and the 'roof' of it is where the armory/storehouse/workroom for the Forge is located. I don't wanna work.. I wanna sit around and bang on the forge all day." The problem is whether or not #1 has the facilities we need to house the slaves along with running water. Somehow I doubt it since all other houses lack what we need, but it might be useful in its own way. For all we know we're already using #1 as the Slave Quarters. It may just be that Kern didn't tell us about it. Thank you, first round of changes done. Go ahead and ask which building it is; I think that Kern would be able to tell you. However I think that you are being a little over ambitious when it comes to running water. Most people in the world don't have it, and currently we only have 3 outlets of our water system. I think that your best bet would be to use pots to take the water to the needed areas on a daily bases. Merlune wrote: Go ahead and ask which building it is; I think that Kern would be able to tell you. However I think that you are being a little over ambitious when it comes to running water. Most people in the world don't have it, and currently we only have 3 outlets of our water system. I think that your best bet would be to use pots to take the water to the needed areas on a daily bases. I like to think that we have ALREADY 3 outlets so that means we can add more. I'm pretty sure we use the water pot system right now but as we can see from the slave condition it's just making them sick and unlike clanmembers the slaves realy don't care very much about their own wellbeing (a serious headache on my part I assure you). If we manage to add running water to the slavequarters I hope we can enforce strikter hygene on the slaves and cure or at least stop the spread of the parasites and leprocy. hm, looking at this map has brought up something. Miners have no where to live ATM. So, I was thinking, the miners can take building #3 as our temporary housing/office until we make one somewhere else, or decide to stay there.